The UK has a very well established top down approach to development, whether a project is initiated by a developer, a local authority (including Housing Associations as Registered Providers) or even a charity many of these projects tend to follow the same process. Starting with land, or an asset, decisions are often made speculatively, based on market projections and the intention of generating a profit (with the exception of charity work which whilst still top down is neither speculative or profit led) the brief is then given to a design team (architects, engineers, consultants etc) who then make it work for the site and then it gets built. This system will consider the user or occupant, but frequently they are placed secondary or third, behind the financials and the sometimes even the practicalities. Not all developers/local authorities/charities work this way - just the majority. Market equilibrium appears to be a myth! Hitting profit targets in an assumed perpetual growth economic system means the price will always go up, even when their supposed to go down. It is the ‘Average Income’ bracket of society that interests me the most; they fall through the gap, not qualifying for LA housing, and not reaching the financial thresholds to obtain market housing. Frequently this is families, perhaps with single incomes, couples with minimum wage jobs or singles who want to live differently, independently or in community, not with Mum & Dad or in an HMO. Community Led housing offers the means to develop contextual and appropriate local responses to these needs which fall through the Neo-liberal, capitalist and market led, top down framework for housing development which we currently have. What is Community Led Development? For me, starting with the users, the occupants is surely appropriate in the design process? 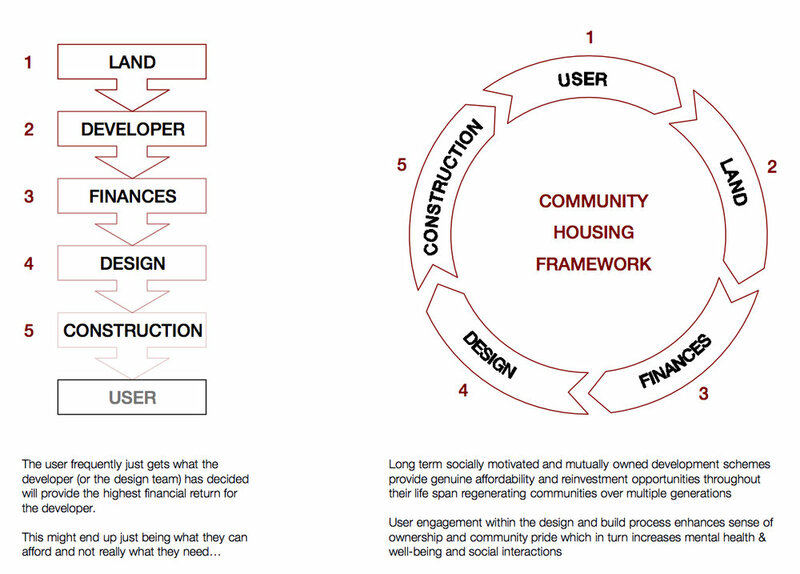 Community housing starts in this way, usually with the potential end users themselves getting the ball rolling. This user engagement embedded within the process provides a manifold increase in the ‘ownership’ occupiers take of their homes resulting in better kept buildings, communities and social structures. This in turn increases the lifespan of the development itself, potentially providing accommodation for multiple generations of families. During 2018, in partnership with Brighton & Hove Community Land Trust, we have facilitated regular community engagement meetings where resident’s views carry weight and are discussed openly and incorporated into the design process. As you can imagine, this is not neat and tidy, it can be a messy and iterative process which seeks to give value to people’s opinions and views by not focussing on ‘problems’ but searching out opportunities within the myriad of ideas which get brought into the mix. In Coldean this engagement grew from some initial ‘Have Your Say’ meetings to ask the question “What do you need?”. The resulting ideas developed into focus groups and coalesced into working groups focusing on specific projects such as re-invigorating green and public spaces, Neighbourhood planning, Community sports facilities and affordable family housing. The latter two groups have now formed a Community Benefit Society and are currently preparing proposals to partner with the Community Land Trust and the Local Authority on developing for construction. Alternative frameworks such as cooperatives, co-housing, mutual ownership, neighbourhood planning, self help housing etc, are too frequently seen as the domain of the hippy, the lefty, the free-loaders even. That perception is starting to change and it needs to. These systems offer genuine alternatives to communities and groups who want to work out housing for themselves rather than choose from a lacklustre list of copycat lego developments that are proliferating our landscape. Studio Sevens are working would be to figure out how to develop a coherent and robust alternative framework using existing mechanisms, in a format that Central Government, Local Authorities, Lenders and Landowners, the general public and yes, even professionals and developers can understand and operate within. Drawing heavily from Kate Raworth’s Dohnut Economics book we have taken 7 ways to think like a 21st century economist and considered what they mean for housing (principally and also community development. Housing should be for people NOT profit. The financialisation / commodification of housing is part of why prices have risen so much over the years. The housing market is probably the only thing keeping out economy looking vaguely healthy. Good housing stabilises society and enables health - More efficient, less damp, better insulated and ventilated homes reduce the stain on the health services and increases people’s opportunities to engage with society without stigma. Building community reduces isolation and enhances lives - designing in collaboration, participation in and working with those you’ll live around. Your house should NOT be a financial asset to depend upon, it should be your home. Rethinking our approach to how housing and communities are developed is an essential part of reducing the impact we are having on the environment. Studio Sevens involvement in establishing the Brighton and Hove CLT was always stage 1 of a larger strategic vision. Stage two being the Engagement, Enlightenment and Empowerment of communities through mechanisms such as Community Consultations or ‘Have Your Say’ meetings, Neighbourhood planning (we have to make that more straight forward and accessible) to develop local responses and Collaborative working models for professionals and agencies involved in housing and communities. Stage 3 requires Shared Financial Systems and mechanisms for enabling community led development and mutual models to get off the ground. There are some alternative models out there being used, most are fairly complex or cannot really fly because the the Neo-liberal economic culture we have is just not conducive to more ‘socialist’ financial approaches. That said, banks such as Triodos, Ecological BS, Unity, CAF etc are supporting alternative approaches, systems such as cooperative loan stock could be unlocked more to enable other mutual ownership, community benefit projects to get off the ground. Community Led Development is the means to create highly sustainable, affordable, efficient and dignified neighbourhoods. It has the potential to transform our cities, our towns and our society from an individualistic, asset led housing-centric economy into one that places people and the planet first.